Chevron is a name to describe a pattern of inverted “V” shapes. The pattern has been around for centuries, even showing up in ancient stone carvings and art work. During the 1970’s, the Chevron print was very popular, and today in 2015, it is making a strong comeback. You can find this trendy geometric pattern on everything from clothing and purses, to home decor. 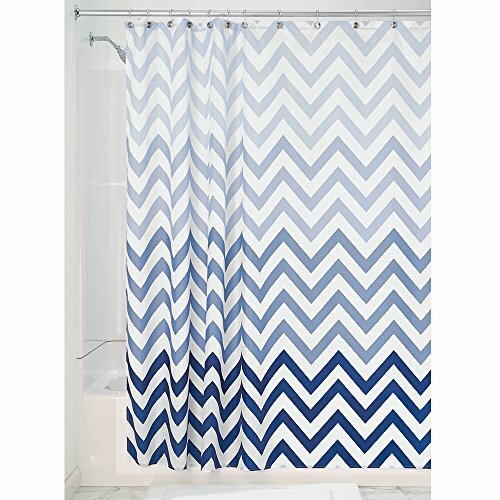 Many people have opted to bring the Chevron pattern into their bathrooms. 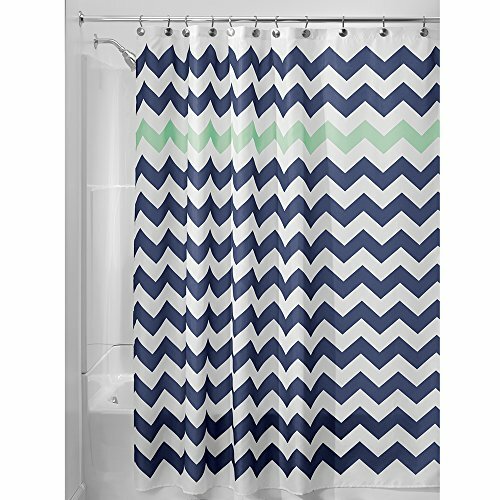 Here we take a look at some of the trendy Chevron bathroom decor products available today. This shower curtain is made from 100% polyester fabric and has 12 reinforced button holes and weighted hem. Curtain can be washed in machine for easy care. Use of a shower curtain liner is recommended. 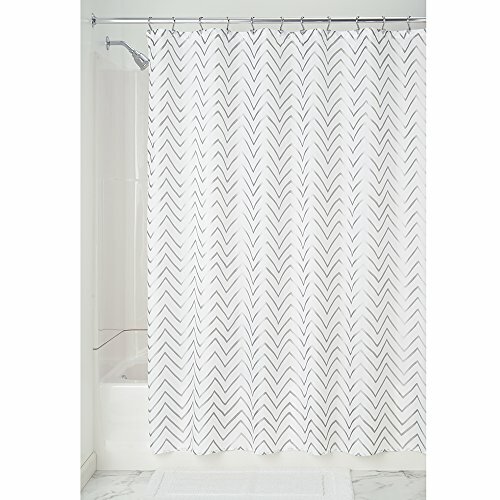 This curtain features a Chevron print with twelve rows of pattern, 11 gray, with the fourth row from the top being yellow. 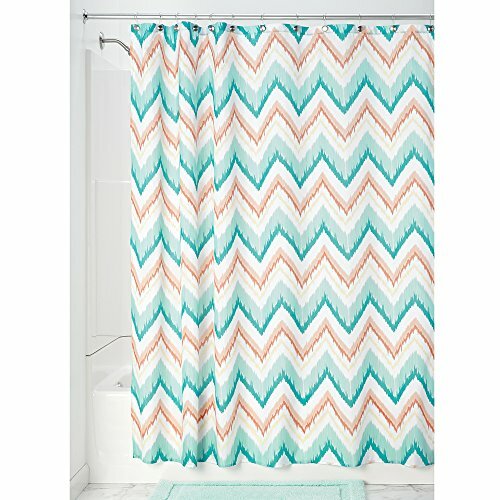 This curtain is also available in other colors: 11 Aruba blue rows with coral colored fourth row, 11 gray rows with one Aruba blue fourth row, 11 gray rows with fourth row in Orchid, 11 gray rows with fourth row in Coral, and in five other patterns that differ slightly from this one (some of the patterns are different Chevron styles, while others are not). 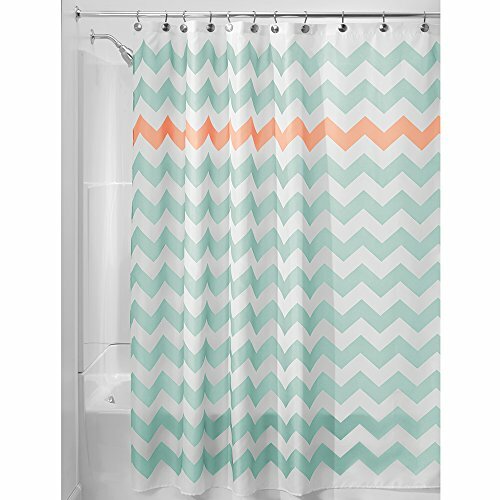 Shower curtain is also offered in three different sizes including 72 X 72 inches, 108 X 72 inches, and 54 by 78 inches. 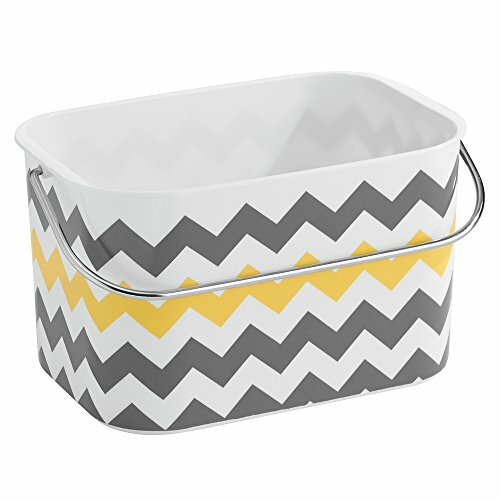 This basket is made from plastic and features gray and yellow Chevron print and chrome handle. Measures 9 inches by 6.5 inches by 5.25 inches. Great for storing bathroom items such as hand towels, cosmetics, styling products, and more. 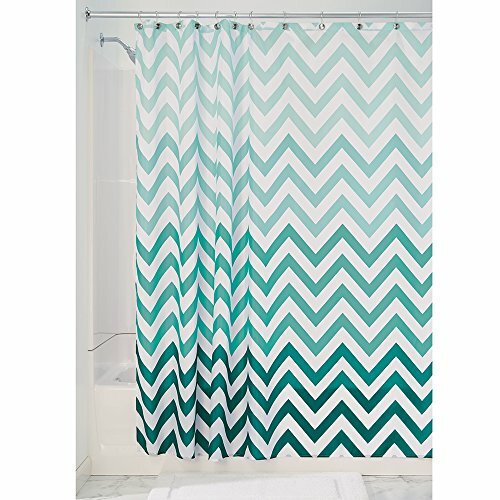 Coordinates perfectly with the Chevron shower curtain of the same brand. This shower basket is the perfect place to store shower items such as shampoo, conditioner, bath scrunchies, body wash, or bath toys. Constructed of durable white plastic and measures 9 inches by 4.5 inches by 4.25 inches. Adheres to the wall of the shower with two strong suction cups to hold it securely in place. Great storage item for keeping all of your bath and shower supplies organized and handy and the shower area free from clutter. 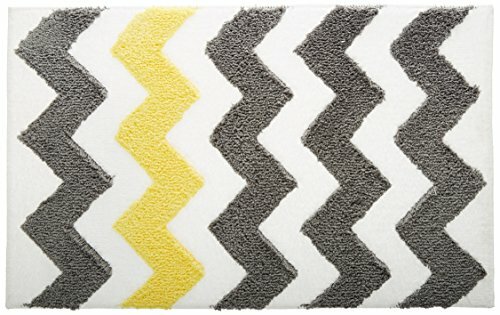 In keeping with the yellow and gray Chevron bathroom decor theme, this soft rug is perfect for stepping onto right out of the shower. Rug quickly absorbs water and features a non-skid, no-slip back. Can be machine washed for easy care. Made from 100% microfiber polyester fabric. Bath rug comes in two size, 34 by 21 inches, and 60 by 21 inches. 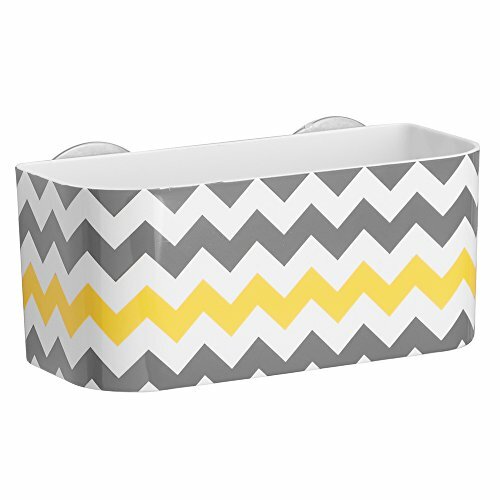 Print features several rows of gray Chevron pattern, with one row of yellow. Also available in gray and Aruba, gray and orchid, and light gray and coral colors. 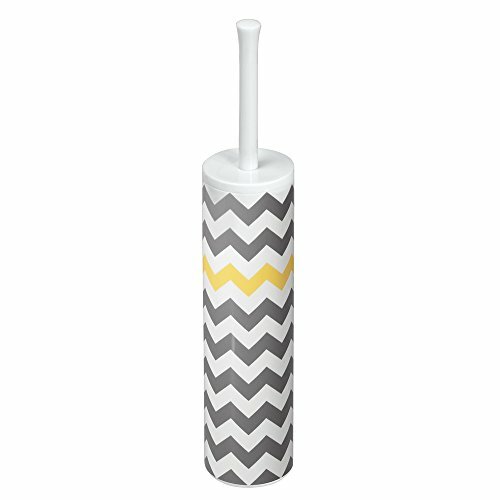 Discreetly store your toilet bowl brush while staying with your Chevron bathroom decor theme. Black bristled bowl brush fits inside the attractive gray and yellow Chevron pattered, durable plastic holder. Item measures 3 inches by 16.25 inches. 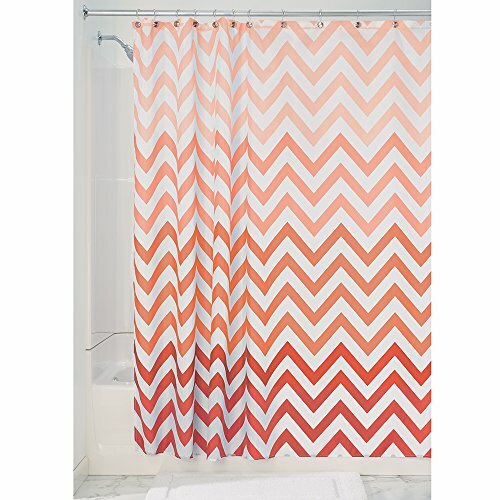 This is a set of twelve sturdy resin shower hooks that match the InterDesign Chevron pattered shower curtain perfectly. 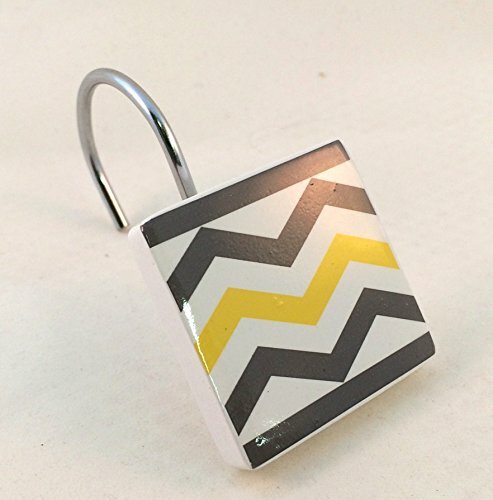 Each hook features a decorative square shape with straight gray border on top and bottom, against a white background with a yellow Chevron stripe in the middle of two gray Chevron stripes. 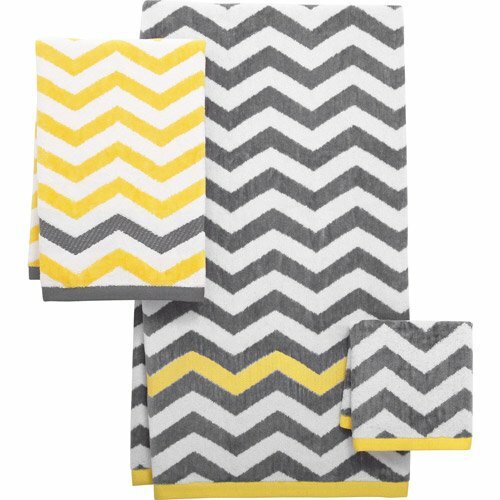 This three piece bath towel set features the gray and yellow Chevron pattern and is made from a super soft and absorbent 100% cotton fiber. Bath towel is mostly gray Chevron stripes with one yellow stripe and yellow trim. Hand towel is mostly yellow Chevron stripes with one gray stripe and gray trim. Wash cloth is gray and white Chevron stripes with yellow trim. Set features one bath towel, one hand towel, and one wash cloth. Help keep your bathroom countertop clean and organized with this ceramic three piece set. 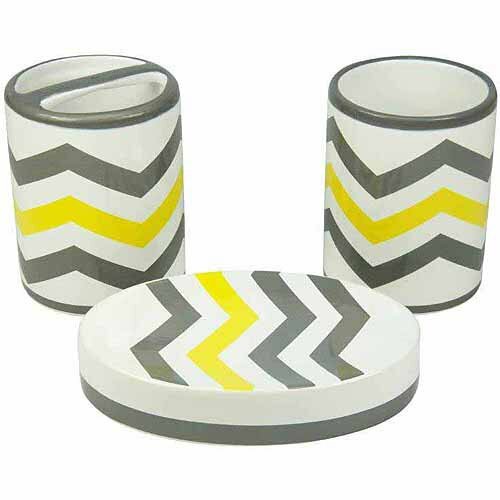 Goes perfectly with other Chevron bathroom decor and features gray striped Chevron pattern with one yellow Chevron stripe. Includes one drinking cup, one toothpaste/toothbrush holder, and one oval shaped soap dish. This product is sold at Zazzle with design by jenniferstuartdesign. Features a two piece set with ceramic soap, lotion, or facial cleanser dispenser and ceramic toothbrush holder that stores four toothbrushes. Dispenser top features stainless steel top. 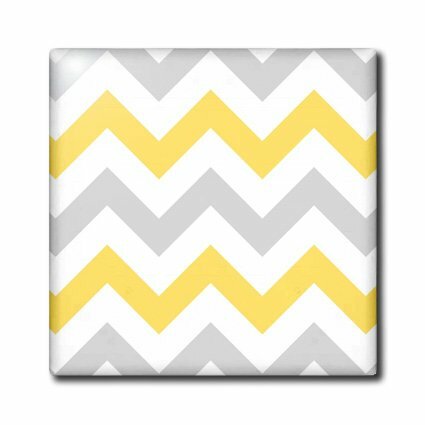 Pattern is a gray and white Chevron striped pattern with customizable yellow area measuring 4.25 inches by 9.26 inches. Area can be used to have your monogram printed in the space to personalize the set. This ten inch wall clock makes a great addition to your bathroom decor, adding splash of pattern and color. Features round, black plastic case, black hands, Quartz movement, and gray, white, and yellow Chevron stripe pattern. Operates with a single AA battery, which is included with the clock. If you happen to be remodeling the bathroom and want to stick with your Chevron bathroom decor, consider placing a few decorative ceramic tiles here and there. 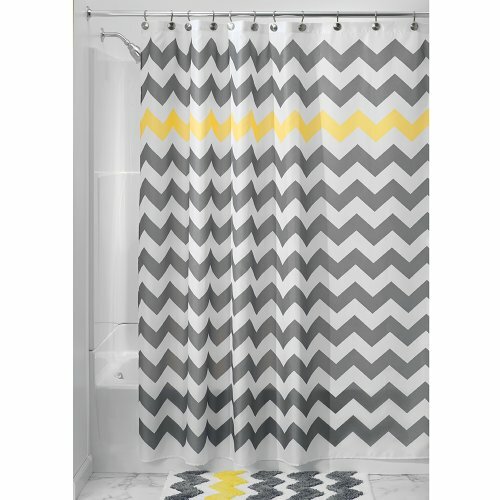 This pattern is done with gray, white, and yellow Chevron stripes and could be placed intermittently among solid color tiles in creating a new backsplash for the bathroom. Keep in mind you might want to change your bathroom decor someday, so keep the decorative tiles to a minimum so that you can replace them if desired when changing decor in the future. Tiles are construction grade quality with image applied to the surface, topped with a high gloss finish. Can be easily cleaned with a mild detergent. Tile sizes available include 4 inch ceramic, 6 inch ceramic, 6 inch glass, 8 inch glass, and 12 inch ceramic. 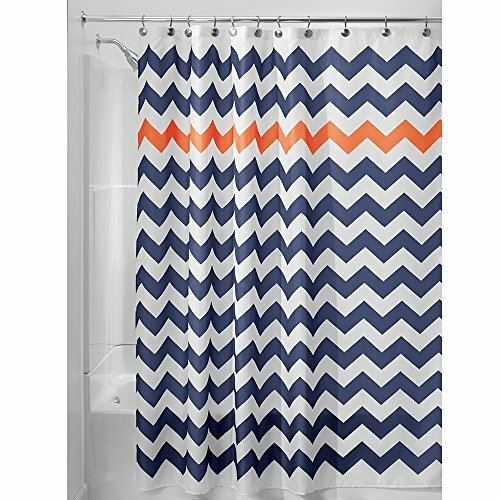 Chevron isn’t just in yellow and gray. Here are some other chevron color combos. And even more color combos that can be personalized with a monogram or other text.